The Bird of the Month for March was entirely influenced by the charming conures that I was lucky to meet in Mexico last month! 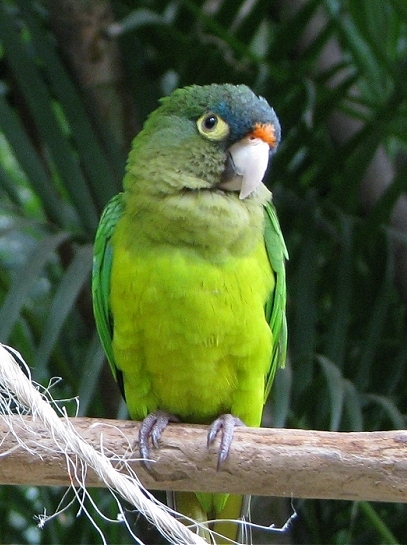 It is the Half-moon Conure/Orange-fronted Parakeet/Orange-fronted Conure (Aratinga canicularis). A glass beaded necklace set, a pendant, a choker and a bracelet charm in this species are currently on auction on eBay for the next week. Also new on eBay this week are an albino Parakeet/Budgie charm, a Green Quaker charm choker, and a colorful whimsical parrot pin that holds a charm that says "Laugh Often". From my little leprechaun to yours, have a blessed day! Dolphins and Whales, oh my! Here's another tidbit from my recent vacation! While on the way to Las Caletas, our catamaran went out of the way a bit to see some sealife. It was really a thrill for me, I had never seen dolphins or whales in the wild. While I didn't manage to get photos, I did catch a bit of video of one of the Humpback Whales surfacing. These charming conures at Las Caletas just stole my heart; they seemed to love all of the attention, and posed so nicely for me! 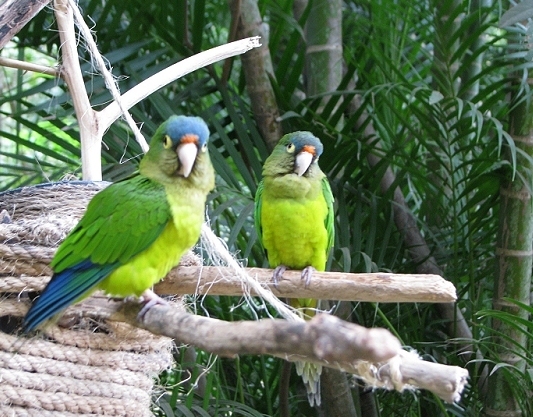 In Mexico they are called Orange Fronted Parakeets, but are more commonly known in the USA as Half-moon Conures or Orange-fronted Conures. 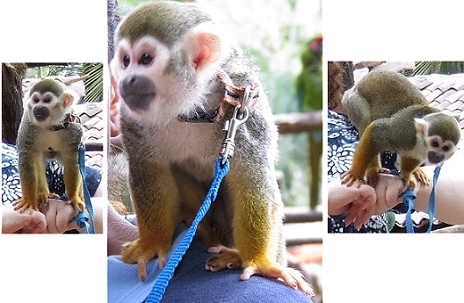 I don't want to leave out Tango, the adorable and extremely active squirrel monkey! He was too quick for me to get good photos, but was fun to watch! Hope you enjoyed these vacation photos! Last month I went on the first real vacation I've had in years, what fun! It was 7 days of sheer bliss on a ship to the Mexican Riviera, and let me tell you, I didn't want to get off! I simply cannot even put into words how fabulous it was! It was fantastic to get away from work/computer/emails/phone and just watch the waves go by. The sunrises and sunsets were beyond spectacular! I've never been on a cruise, so it was quite an amazing experience! It was thrilling to see such happy birds in a natural environment. They do go into cages at night for protection, but are free to fly around the island during day, where they have an abundance of branches to destroy, as well as typical bird toys at the main interactive area. There were about 20 majestic Military Macaws at the island, and you could hear them everywhere - as those of you with macaws in your home know, they are LOUD! I enjoyed holding one and interacting a bit, he was trained to take treats out of your mouth! My blog is out of space for this entry, so will continue with the rest of the photos in a separate post, so scroll above!